Below is an embargoed copy of Muhammad in His Own Words; The Founder of Islam Speaks. This link is for working press only -- redistribution of this link is prohibited. NEW YORK, Aug. 31, 2018 /Christian Newswire/ -- After three-and-a-half years of production, Muhammad in His Own Words; The Founder of Islam Speaks will be released in New York City on September 11 in a Manhattan movie theater. The name and address of the theater is being withheld until next week for security reasons. 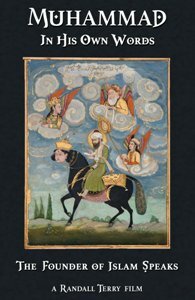 Muhammad in His Own Words uses ancient Islamic texts and art, as well as Muslim voice actors and original art compositions from four continents to tell the story of Muhammad's life, and the founding of the religion of Islam. All of the material is meticulously footnoted for the viewer to verify, and research in further depth if they choose. Written and Directed by Randall Terry, MA; Diplomacy, International Terrorism. Randall Terry has a Master's Degree in Diplomacy, with a concentration in international terrorism from Norwich University. Norwich University is one of the oldest, and most prestigious military schools in America, including being the birthplace of the ROTC program. The bulk of Mr. Terry's research for his Master's Degree focused on modern Islamic terrorism, and the ancient Islamic texts. These "sacred texts" provide the narrative that Islamic terrorists imitate and the commands they obey. As Mr. Terry did his research, he learned that no movie had ever been created utilizing the "sacred texts" of Islam regarding the life of Muhammad. Hence, Muhammad in His Own Words; The Founder of Islam Speaks was conceived. As might be expected, Mr. Terry has been subjected to multiple death threats as a result of this project. Also, Facebook has canceled the movie's account, and YouTube is threatening to cancel the movie's channel. "I am thrilled that after three-and-a-half years of writing and production, Muhammad in His Own Words is ready for release. My research and subsequent writings demanded rigorous adherence to the facts – as presented by Muslim historians and theologians. - The Sira (biography) of Muhammad – also known as The Life of Muhammad by Ibn Ishaq. "This movie is nothing more or less than the facts of Muhammad's life, as preserved and presented by his most devoted followers, and Islam's most respected sources. I hope this presentation is helpful in these critical times."